Upgrading a wireless card should be every bit as easy as upgrading the memory modules. In fact, on some machines, both the wireless card and RAM are located under the same panel. The trick is to make sure that you install a compatible part. Most laptops that were made a few years ago use Mini PCI cards, while newer ones use the Mini PCI Express standard. Mini PCI cards have only one set of connectors along the narrower side; Mini PCI Express cards have two. Even if the card you get has the right connector, it's not guaranteed to work in your laptop. You need a sufficiently up-to-date laptop with a sufficiently recent form of Wi-Fi to be able to take advantage of the newest, fastest version. You should be able to update an older model, but not necessarily one that's between one and three years old. Upgrading to wireless-n: You might be surprised to discover that you're pretty unlikely to be able to upgrade from 802.11b Wi-Fi to 802.11n as few Mini PCI cards exist. On the other hand, you should easily be able to switch from 802.11b wireless to g as there are plenty of 802.11a/b/g cards. 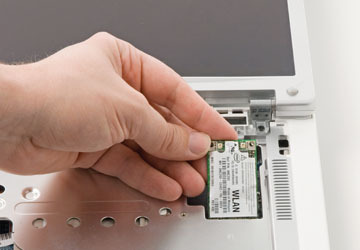 Many laptops that came with 802.11g cards can be upgraded to meet the latest 802.11n standard. 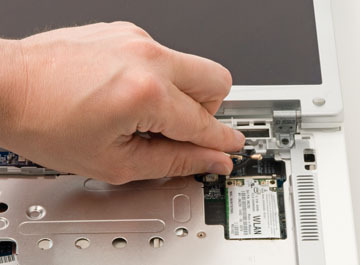 To avoid firmware incompatibilities, we advise you to get this part directly from the manufacturer of your laptop; in any case, it should be sold specifically for your computer. Once you have the right part, performing the Wi-Fi upgrade is easy. If your wireless card is under the keyboard, as is the situation with the card in our photo (below), you'll need to remove the keyboard. We've explained how to do that in the steps for upgrading your RAM. Next, locate the wireless card and disconnect the two antenna wires by pulling straight up on the connectors. Don't pull on the wires themselves. Remove the old wireless card by pulling apart the two holding clamps on the card's sides. Pull the card straight out. Insert the new card and reattach the antennae by pushing the connectors straight down on the plugs. If your wireless card is located on the underside of the machine, things are much easier. You can simply flip the laptop over, remove the appropriate panel and follow the installation instructions we've provided above.